Melatonin has been used to improve sleep for decades and is considered a relatively safe natural product when used correctly. Unfortunately melatonin does not actually induce sleep. Its mechanism of action is considered to be one of resetting the body's biological clock. This is also known as an internal clock or biorhythm which involves a pattern of activity and rest within a 24-hour period. The pattern occurs even without external clues (ex: night / day). Sometimes our internal clock is off and melatonin has been found to be very effective in helping to return it to a more normal state. Melatonin is actually a hormone that is produced in your body by the pineal gland. The gland produces the melatonin hormone when it is dark and then stops production during the bodys exposure to light. Consumers who benefit the most from Melatonin are shift workers with sleep disorders, and those individuals who experience early morning awakenings – all things that deal with the timing of your need to sleep. Melatonin is not considered an effective treatment for insomnia. Consumers should follow directions regarding dosage amounts of melatonin and not exceed them. More is not better when using Melatonin and the following side effects have been reported with its usage. In our search for the optimal blend of sleep inducing ingredients, we could not leave out melatonin. But because of the route of administration with Quick 2 Sleep™ digestible oral strip we were able to use an extremely small dosages of melatonin. 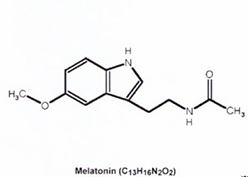 Melatonin in pill form is assimilated or used by your body rapidly unlike the melatonin produced naturally by your body. These bursts of melatonin are experienced in the brain. If you have tried or currently use melatonin ensure that you are not using high dosages that could lead to side effects or cause other bodily harm.